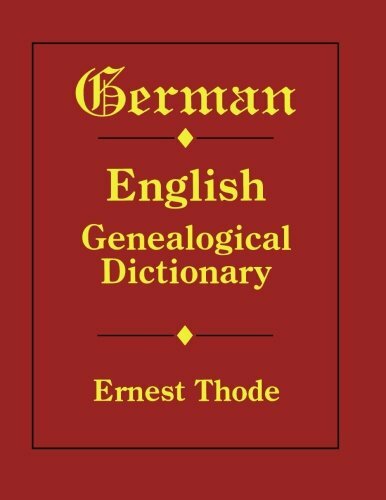 This book is designed for the family researcher who has little or no knowledge of German but who nevertheless needs to make a translation of German-language documents. The dictionary covers thousands of German terms and defines them in single words or brief phrases. All words, symbols, and abbreviations in the dictionary were chosen on the basis of their association with genealogy, having been noted in church records, civil registration records, family correspondence, genealogical journals, ships' passenger lists, and emigration records. Among the many categories of entries included in the dictionary are family relationships, days of the week, map terms, legal terms, cardinal and ordinary numbers, roman numerals, signs of the zodiac, coins, liquid and dry measures, measures of length, place names, historical territories, geographical terms, occupations, titles, military ranks, types of taxes, illnesses, calendar days, male and female given names, heraldry, abbreviations, books of the Bible, and common genealogical words from Danish, Dutch, French, Latin, and Polish. In conjunction with a standard German-English dictionary, the user of this work should be able to make a word-by-word translation of any German document and understand it. Manufacturer: Genealogical Publishing Company, Inc. Brand: Brand: Genealogical Publishing Company, Inc. Publisher: Genealogical Publishing Company, Inc. Studio: Genealogical Publishing Company, Inc. If you have any questions about this product by Brand: Genealogical Publishing Company, Inc., contact us by completing and submitting the form below. If you are looking for a specif part number, please include it with your message.